Martí Guillem is one of those thorough musicians always playing, experimenting, mixing, collaborating and even organizing things to do in the realm of sound. As an improviser he has been involved with various ensembles presenting collaborative projects such as the ultra-noise ensemble AttA (with our dear Avelino Saavedra), LOM or ESOC (és amor) a strange project that could be defined as if Lady Gaga and Merzbow were dating in Valencia. Apart from the variety of collaborative projects Martí is involved, he also has time to work out his personal projects. Those are always a combination of pretty simple elements of our daily live and a very precise study of the sound capabilities of them. It seems that Martí is obsessed by the idea of taking advantage of the most simple elements and to expand them into a whole world of possibilities. The two pieces Martí Guillem gladly delivered to us are a testimony of his recent explorations on sound and improvisation around two simple objects or ideas. 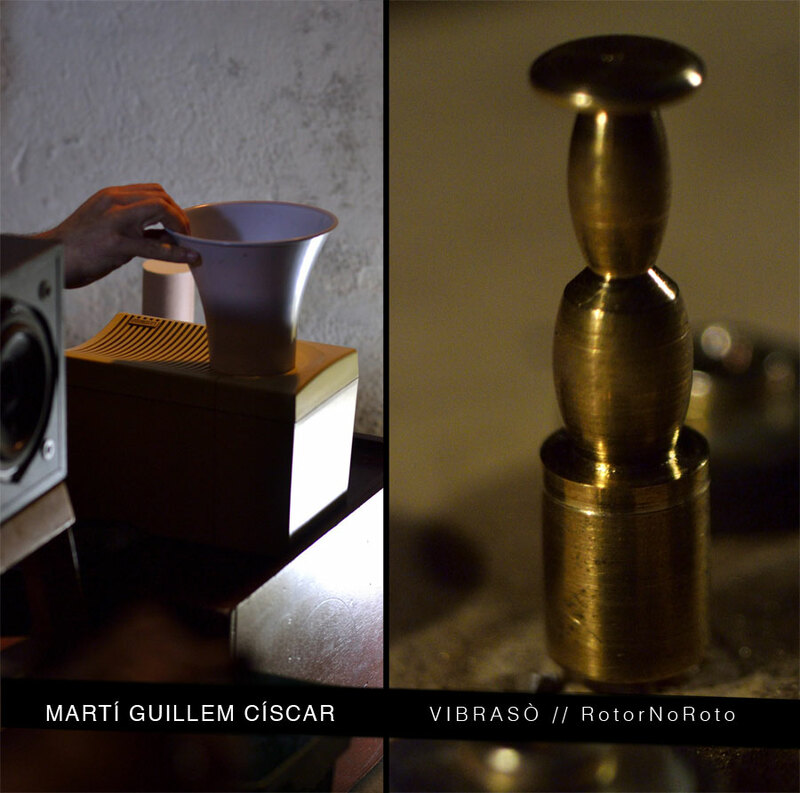 VIBRASÒ is a an improvised piece done using speakers as instruments and instruments as speakers. Through the usage of vibrations and air pressure from synths, Guillem make different surfaces, materials and objects vibrate and therefor resonate. Through a very simple idea Martí is capable of unveiling a whole universe of sonorities, textures, drones made of the very essence of sound: air vibrating. In RotorNoRoto a modified turntable motor is the mechanism in charge of moving things and therefor make them sound. This improvisation uses the constant rotating movement of a turntable to deliver textures, rhythms and drones. Even simpler than VIBRASÒ but equally powerful if the musician is as skilled as Guillem. And that’s what’s all about: about being able of engaging the listener, viewer, spectator into something as (in terms of sound) raw as this. Accompanying the two composed versions of VIBRASÒ and RotorNoRoto, we are glad to present two videos by Damià Jordà, recorded at Plutón.cc on June 2013. Live recording of Marti Guillem’s concert at Off_Herzios the last 14th of December 2012 at Kessler Battaglia Gallery in Valencia. Recordings mixed an mastered by Benigno Moreno. All tracks performed and mixed by Martí Guillem Císcar. All sounds recorded at La Granja, Xàtiva (Spain) between 18th and 20th of July 2013.